Landscape studies provide a crucial perspective into the interaction between humans and their environment, shedding insight on social, cultural, and economic topics. The research explores both the way that natural processes have affected the development of culture and society, as well as the ways that natural landscapes themselves are the product of historical and cultural processes. Most previous studies of the landscape selectively focused on either the natural sciences or the social sciences, but the research presented in African Landscapes bridges that gap. This work is unique in its interdisciplinary scope. Over the past twelve years, the contributors to this volume have participated in the collaborative research center ACACIA (Arid Climate Adaptation and Cultural Innovation in Africa), which deals with the relationship between cultural processes and ecological dynamics in Africa's arid areas. 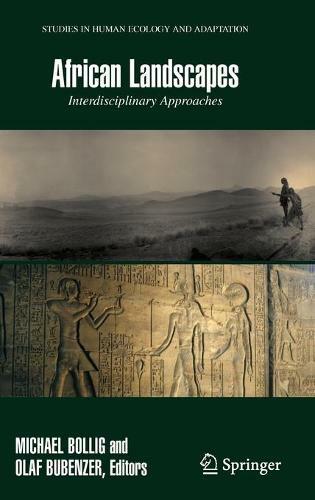 The case studies presented here come from mainly Sahara/Sahel and southwestern Africa, and are all linked to broader discussions on the concept of landscape, and themes of cultural, anthropological, geographical, botanical, sociological, and archaeological interest. The contributions in this work are enhanced by full color photographs that put the discussion in context visually.